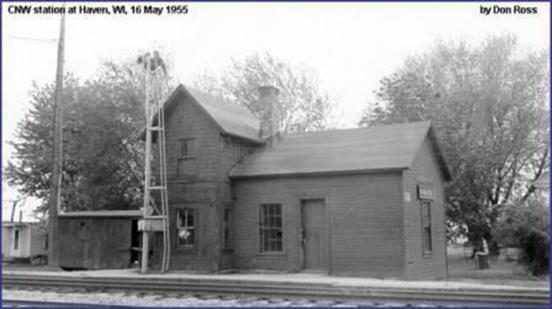 The Tap Creek depot. 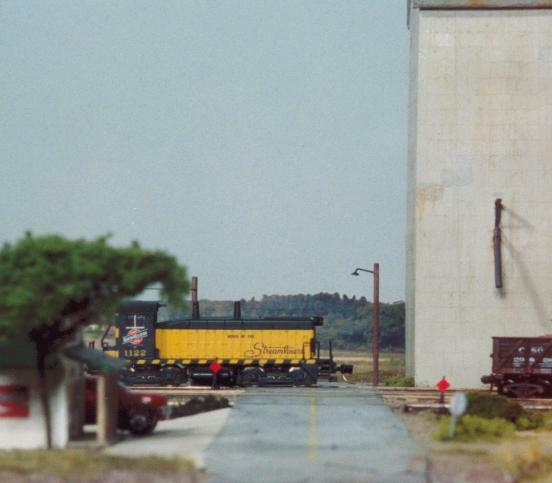 I based this model on an actual prototype - the station in Haven, WI, as it appeared in 1955. 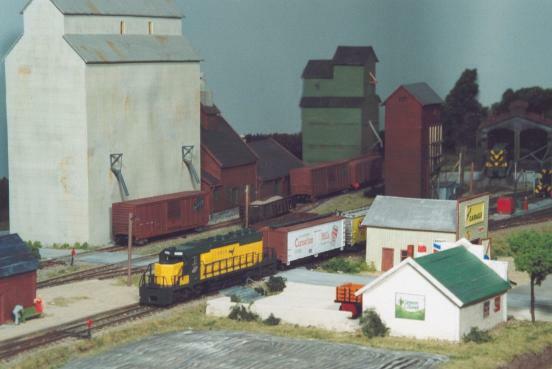 Below is the photo I used as a prototype for my Tap Creek depot. It is included here with kind permission of Don Ross, the photographer. Don manages Don's Rail Photos, a Web site with a lot of rail photos. If you want to see more C&NW stations you can also go directly to the C&NW Stations and Towers page on that site. Another view of the Tap Creek depot. This picture shows an overview of the depot and general store area, although the depot itself is only partly visible to the left. The general store is the white building to the right. Across the street from the store is Len's Garage. In the background you see a couple of grain elevators and a feed mill. CNW6910 is leading a short freight, heading out of town. A view along the road and the grade crossing. I created the road with a forced perspective. It is more narrow towards the background than it really should be. I think the illusion works pretty well. The general store and the parking lot, which is shared by store customers and train passengers. The general store and the grade crossing, with CNW 6910 passing.